I have always had an affinity for fast lightweight trainers. This really started with my (uneducated) foray into minimalism years ago which eventually led me to one of my favorite trainers, the original Saucony Kinvara. Later this love would take me to many years in the Saucony Mirage (versions 1 and 3), Brooks PureCadence (versions 1 through 3), PureConnect (original), New Balance 1500v1, Skechers GOrun (versions 1, 4 and 5. Review of the 5 coming soon), Adidas Adios (version 2, Boost 1 and 2. Although technically a racer I used this as a lightweight trainer many times), Nike Zoom Speed Rival 5 and many others (I have posted reviews of most of these shoes which can be found in the Reviews section). Now I typically train in traditional trainers (my favorite being the Pegasus 33 at the moment) but my lightweight trainers serve as the workhorses for most workouts. 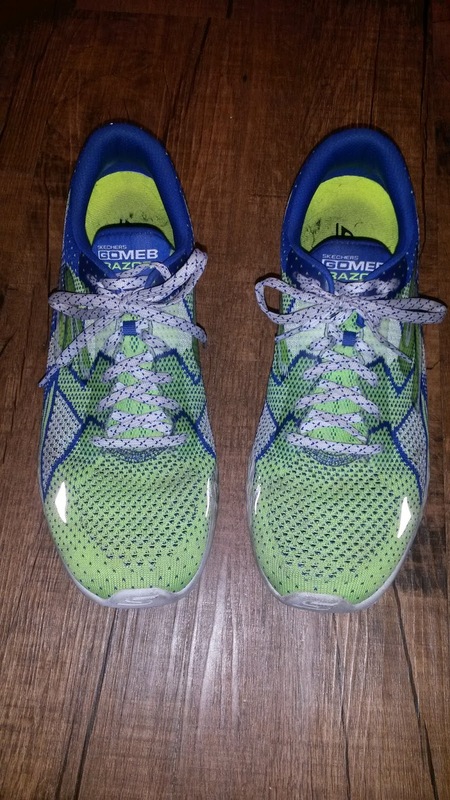 The GOmeb Razor is definitely a shoe that has managed to be the perfect lightweight trainer. It is a firmer, faster, lightweight shoe that would work well for longer races but has just enough cushioning for use as a trainer for efficient runners. Now after going through 3 versions of the Razor, I can say that although it will continue to evolve, this is a shoe that will work for many and that many should at least try it. Why? Well let's talk about that. The sole is very different from previous generations of Skechers Performance shoes (as will all SP shoes from here on out). Gone is the podular outsole and in it's place a smooth, full ground contact outsole with (finally) some additional durable rubber (name). The midsole is made of Skechers new and improved 5Gen material, which is firmer, more responsive and more resilient than previous materials used. Gone also is the midfoot strike zone and in it's place the full ground contact outsole with a consistent midsole ride throughout. This is one of the many things that contributes to the extremely smooth ride of the Razor. As with most of their shoes, the Razor also has a mild heel curve in the sole that also contributes to the smooth ride. This is an aspect that I feel should be included in all shoes to mimic the shape of the calcaneus (I have written about this many times before) but a few companies out there (Asics) continue to have some trouble with this. Additionally, the removal of the pods makes the sole a little less flexible but gives the shoe a little more kick along with the improved firmness of the 5Gen material. The 5Gen midsole material is not bone crushing firm (as was the GOrun 4 to a degree) but instead the sole has some rebound that feels very good during both faster paced runs/workouts as well as during the end of long runs when your legs lose some of the bounce. The improved and increased width and surface area of the outsole makes the shoe more stable inherently than previous versions. This is not the kind of arch support stable, but whole foot, wider base type of stable, which does help redirect forces in the sagittal plane (front to back) rather than lateral to a minor degree. 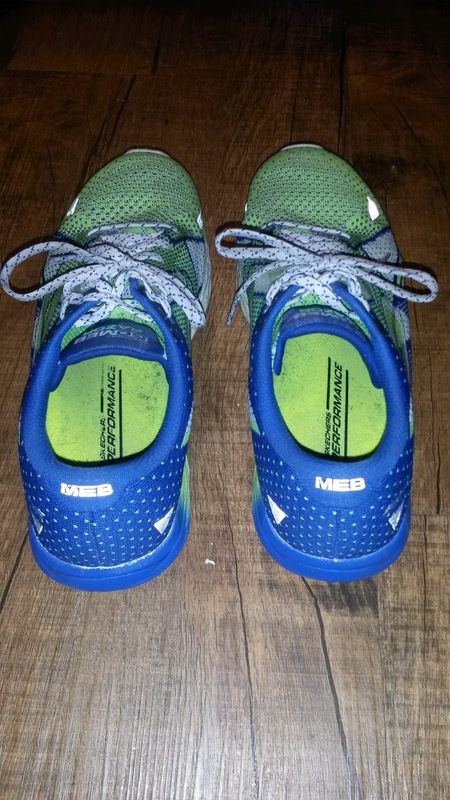 This shoe is meant to be a more cushioned and more durable version of the GOmeb Speed and it very much lives up to being a more cushioned but lighter and speedier shoe. It's similarities to the Speed include a similar 4-6mm heel drop that is immediately apparent. I have enjoyed using this shoe for everything from fast fartleks, tempos, to fast long runs and have never had a problem. I do need to work on my arch and foot strength as I am usually used to more stability elements in shoes, but have been working hard (as I should as a Doctor of Physical Therapy) and have had no issue with the Razor. If anything I have trouble keeping the pace down in that shoe because it feels good to run fast in it. The removal of the pods not only makes the outsole more stable, but also increases the durability as the increased ground contact spreads forces out more evenly. The addition of extra durable outsole material also has made this one of the more longer lasting lightweight trainers of the Skechers line. Previously I had durability issues with the GOrun 4 (as well as previous versions of the Ride and GOrun). The Razor does start showing signs of wear after ~100 miles (as do most shoes) but have lasted into the 250 mile range with feeling too broken down despite being only 7.7 oz (men's size 9). This in my mind is very good for a lightweight trainer, which I personally (I tend to be very hard on shoes) do not usually expect to get more than 200-300 miles out of most (and 300-400 miles out of traditional trainers if I'm lucky). This is another Skechers Performance release with their GOknit uppers, which I believe the Razor does the best job of integrating with traditional durable uppers. The GOknit upper in the Razor is a bit thicker than previous versions of GOknit, but continues to mold very well to the foot almost immediately during the run. I have not had any foot slippage issues in the shoe despite the more flexible upper, likely due to the increased density. As with the increased density, I have had zero durability issues with the upper despite some very hard workouts in this shoe. The GOknit continues to be a very durable and comfortable upper without being too heavy, which is a rare combination. The fit of the upper is is above average in the forefoot without being sloppy. The GOknit does a good job of molding to the foot but the forefoot is a bit more square than other shoes. 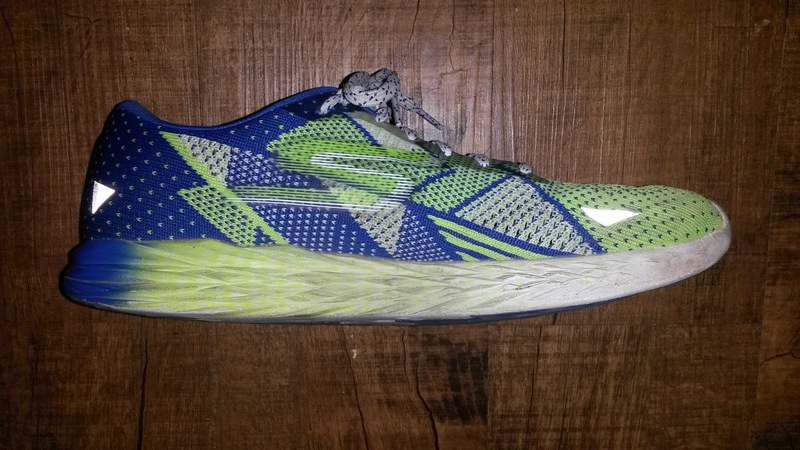 It is nowhere close to an Altra, but per Skechers they seem to always have a more natural footshape in the back of their minds when it comes to shoe design. Be wary though that if you have a very narrow foot, you may need to tie the laces down a bit more tight. The heel is much more traditional, being fairly average width. The lack of a substantial heel counter in the shoe is great for those with sensitive heels (haglund deformity, which can come from overly tight calves/achilles tendons pulling excessively on the calcaneus bone. Stretch and strengthen!). There is a minor and flexible one that I usually forget about quickly (which is how they should feel). I used to be a bit concerned that a lack of a thick heel counter would make a shoe a bit more unstable. However, the heel aspect of the upper does a great job of fitting to the rear part of the foot and as mentioned earlier I have not had any heel slippage issues. I have continued to move away from some of my earlier training about heel counters and have found both through personal and patient experiences that they rarely do what they are supposed to do. Early versions of the GOmeb Razor did have a split heel tab for the achilles, which if you have read my previous posts know that that I really like because it gives a nice place for the achilles to not get pressed on during the terminal stance/toe-off phase of gait. I tend to have a fairly sensitive lower achilles tendon and have had very bad experiences with shoes that combine very firm heel counters and no achilles cut out in the heel tab (aka the Asics DS Trainer). However, later that was changed to a rounded heel to improve the fit and hold around the heel area (per Meb's request apparently). Despite the move to a rounded heel tab in the Razor, the flexible upper has not given me any issues (despite some sockless wear) and actually seems to contribute to a great job of holding the foot. And as I just briefly mentioned, I have not had any issues running sockless in the GOmeb Razor up to 10 miles. That run definitely made me nervous, but the softness of the heel aspect of the upper combined with the Goknit worked very well for me. Would I suggest running sockless in most shoes? No. Everyone's feet are different and while Skechers Performance had sockless running in the back of their minds, these shoes was not specifically designed for sockless running. Those that are very used to that kind of thing will likely not have an issue in the Razor, but I still prefer to wear even light socks with my shoes (the exception being my track spikes). I have discussed before how wider and full ground contact outsoles are more inherently stable. 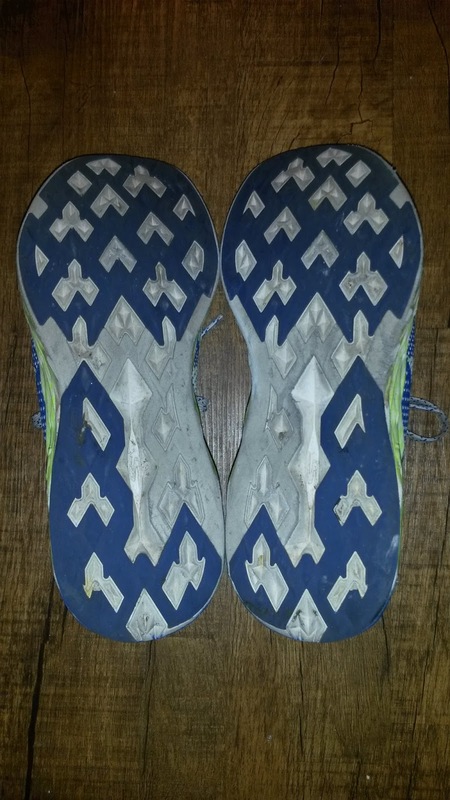 I have discussed split heel tabs vs rounded heel tabs, how the heel curve smooths out the transition, etc. As a Doctor of Physical Therapy, what I like best about the Gomeb Razor is that it is a simple shoe that gets the job done. I do not mean a cheap shoe, as the R&D and materials that went into this shoe are top notch. I mean like the original Brooks Launch, this shoe does not need additional bells and whistles to make it a good shoe. It has a great upper that fits well and a sole that has cushion, rebound and doesn't force the foot in any direction. It is a simple shoe in that it is there to assist the foot. The sole has great ground contact to be both stable and fast. The upper fits well yet does not have any firm aspects that could dig into the foot. What I do find interesting is the diamond like pattern in the outsole does a great job of bending and maintaining flexibility without losing the firmness and speed that many minimal or extremely flexible shoes do. I think the diamond pattern is great because it creates flex points in the shoe in line with the true joint positions of the foot. The talocrural joint (main ankle joint that involves most of the plantarflexion and dorsiflexion), the subtalar joint (below the TC joint, which involves most of the eversion and inversion), the midtarsal joints and the many other ankle joints are not truly in the sagittal or frontal planes. They are all oriented at various diagonal angles. The axis of the talocrural joint is actually about 20-30 degrees off from the frontal plane and the subtalar joint axis is about 15-20 degrees off from the sagittal plane. This is the same reason the recent Nike Frees have diagonal flex groves as those actually match up with those joints. 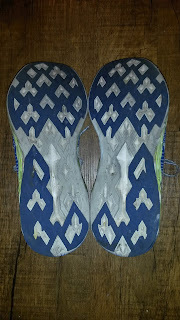 I think this also contributes to the smoother ride of the Razor (this outsole pattern is also used in the GOrun 5). I know I tend to throw the term “versatile” around frequently for many of the shoes I review, but the Razor is definitely a shoe that this words fits with. 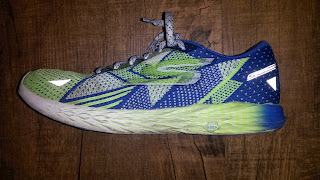 It is a shoe I would reach for if I wanted a fast but protective shoe for longer races and workouts, yet has the cushioning to be used as a lightweight or full time trainer. The 5Gen sole has some good rebound to it (aka responsiveness) but will definitely protect you over longer miles. 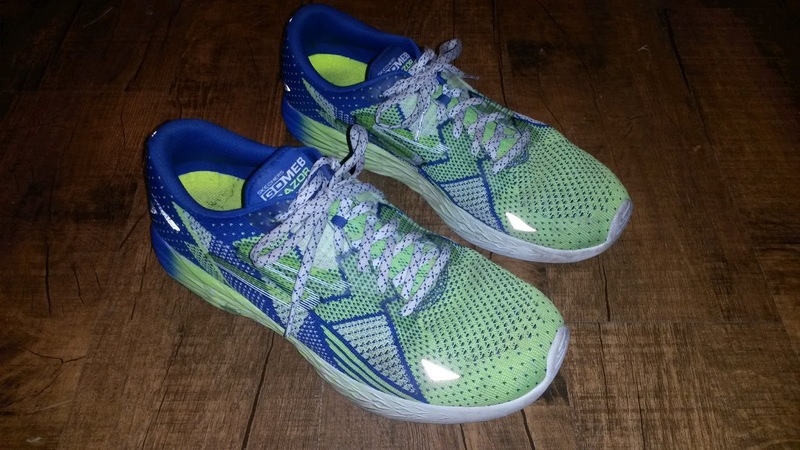 For those looking for marathon racers/lightweight trainers including the Saucony Kinvara, Adidas Adios Boost, Nike Streak 5 (the 6 is a different animal), or even the Brooks Asteria, I would give the Skechers Performance Gomeb Razor a look. You will be surprised at what Skechers has managed to not only do with this shoe, but the many others they will be releasing soon. 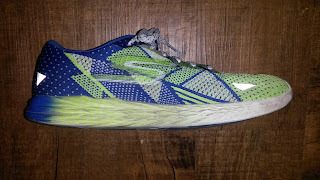 As mentioned many times before, Skechers Performance is VERY serious about putting out good running shoes and they will only get better and more aggressive. These shoes were provided free of charge in exchange for a review. This did not in any way influence or affect my review and views of this shoe. I put at least 75 miles on trainers and 25 miles on racing flats. Currently I have three pairs of Gomeb Razors that have at least 100-150 miles on each of them. A big thank you to Skechers Performance for including me in the development of such cool new serious running shoes. Look for them to make some big changes in the Running Specialty market in 2017-2018.